On January 16, Thai and Russian officials met in Bangkok for deliberations that offered a window into the current state of Russia-Thailand military ties. Russia’s ambassador to Thailand, Kirill Barsky, met with Thailand’s Chief of Defense Forces Surapong Suwana-adth as part of ongoing efforts to strengthen their defense relations. Thai-Russian defense collaboration is hardly new, and Thailand, which is also a U.S. treaty ally, has never shied away from fostering ties with other major powers as well, including China and Russia. But cooperation between Moscow and Bangkok has been on the uptick in recent years. Thailand has been looking to boost relations with several other nations following a coup in May 2014, which complicated its ties with the United States and other Western nations (See: “Exclusive: Managing the Strained US-Thailand Alliance”). Meanwhile, Russia under Vladimir Putin – ambitious abroad and increasingly isolated from the West — has been looking to boost its presence in the Asia-Pacific, including in Southeast Asia. In a key step towards boosting ties, in May 2016, Thai Prime Minister Prayut Chan-o-cha made a trip to Russia in May 2016, the first formal visit by a Thai premier in more than a decade. 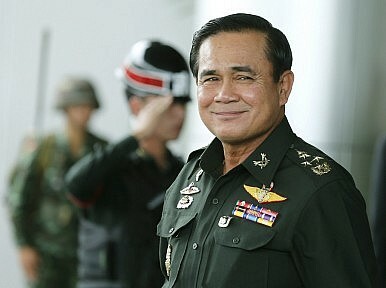 Though Prayut had downplayed the defense component of the relationship, his visit last year came amid reports that Thailand planned on buying Russian helicopters and tanks, and an agreement on military cooperation was one of six pacts inked by the two sides during his trip (See: “Thailand Mulls Buying New Military Helicopters from Russia”). This week’s meeting continued the discussion between the two sides on their defense ties. As was expected, they discussed a wide range of issues, including specific arms sales to broader areas like defense industry cooperation. Interestingly, one of the topics discussed was the setting up of a jointly run production and maintenance facility in Thailand. The facility, according to unnamed sources who spoke to IHS Jane’s, would reportedly support the Mi-17V5 helicopters and other Russian systems in Thailand but also potentially look to provide maintenance support to other Mi-17V5 operators in Southeast Asia. This is not the first time such a facility has been discussed, and Russia is not the only country with which Thailand is mulling such a move. A similar idea has been in the works with China as well, even though details there are as sparse as of now (See: “China, Thailand Mull Joint Military Production Facility”). If realized, though, the facility would be a big step toward greater defense industry cooperation not only between the two sides, but potentially between Russia and Southeast Asian states more generally. But given the fact that even more modest moves – like Bangkok’s purchase of more Mi-17V5 helicopters from Moscow – have been moving more slowly than anticipated, one ought to keep this development as well as the defense relationship more generally in perspective.